Our architecture department was asked to contribute to the television series ‘Onzichtbaar Nederland’, which aims to open up new perspectives on Dutch landscapes and infrastructures. By combining historical maps and photos with data visualisations, the series investigate how our daily living environment has been transformed by new infrastructural technologies and means of transportation. In the December 1 episode, I got the chance to highlight the post-war transformation of Dutch cities and towns, taking Utrecht’s Hoog Catharijne shopping mall as a case study. 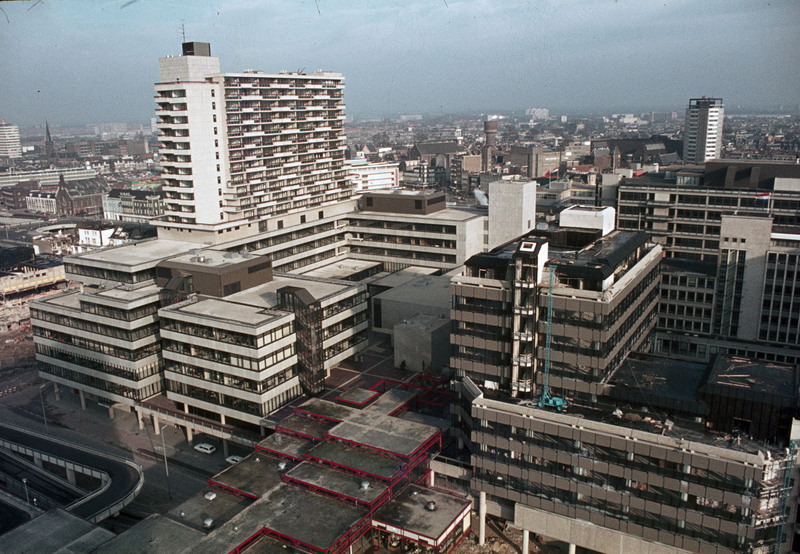 Hoog Catharijne, developed and constructed between 1962 and 1973, was a typical product of post-war urban planning in the Netherlands. Whereas the 1950s should be seen as a decade of recovery and agenda setting, the 1960s were a period in which the country was actually transformed in fundamental ways. Construction of the so-called Delta Works, which were to keep the country safe from sea flooding, and Flevoland, a vast land reclamation project, was in full swing. The port of Rotterdam and Schiphol Airport were growing at tremendous rates. In the countryside, the government was pursuing a thorough redistribution of farming land. However, nowhere was the increasingly rapid pace of modern life more tangible than in Dutch cities. Plans were launched for satellite towns with no fewer than 500,000 inhabitants as well as the wholesale demolition of nineteenth-century areas surrounding the larger cities’ historic cores to make way for multi-lane expressways, luxury apartments and spacious offices. 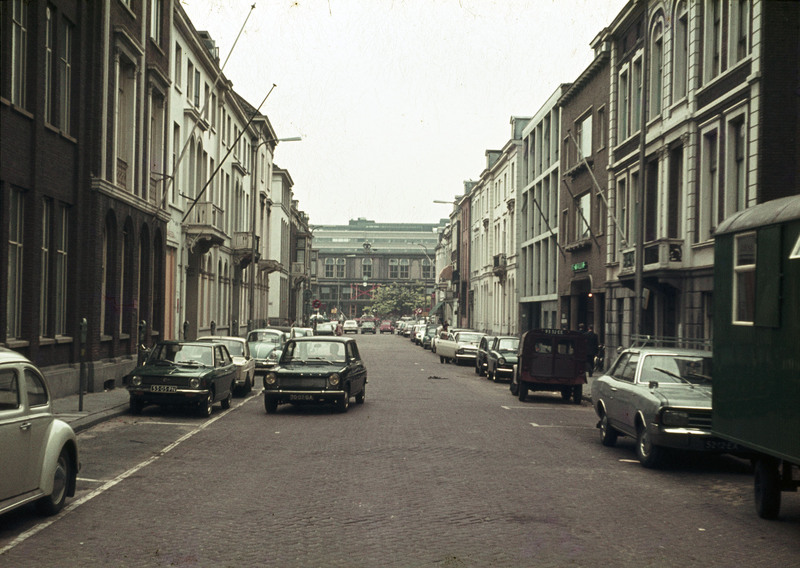 In order to accommodate a growing number of cars, more retail and shopping venues and increasing amounts of office space, several Dutch municipalities considered the comprehensive redevelopment of their inner cities, or at least those areas that were deemed obsolete and outdated. At the time in which Hoog Catharijne was conceived, most planners in the Western world agreed that the post-industrial economy had to physically find its place and thrive in central urban areas. The scheme encompassed the redevelopment of Utrecht’s central railway station and an adjacent nineteenth-century district, the construction of multiple parking garages and an elevated indoor pedestrian area that would connect new businesses and shopping venues to the old inner city. With these features, Hoog Catharijne was suited to accommodate both the emerging services-based economy and the rapid growth in car ownership. Whereas most people consider Hoog Catharijne to be a concrete eyesore, the producers of ‘Onzichtbaar Nederland’ left such pejorative judgments out of consideration, instead focusing on the contemporary worldviews of architects and planners. As an urban historian, I can only agree with this considerate way of working. See the results of our collaboration right here.